Twenty-twenty vision is a term that quantifies the sensitivity of ones vision, and is the size of an object in which specific details can be distinguished from a distance of twenty feet. For example, if someone has 20/40 vision, they would require an object twice the size to distinguish detail compared to someone with 20/20 vision, or they would have to be twice as close to the object to see specific detail. In order to drive an automobile, most state laws require at least 20/40. 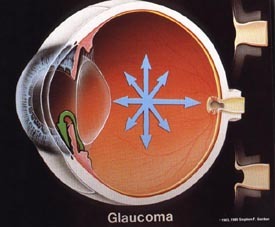 Every year, millions of people world-wide go blind from glaucoma. Just what is this disease, and what can be done about it? Glaucoma is a group of conditions in which the optic nerve cells in the back of the eye have died at least partly due to pressure inside the eye (intraocular pressure) exerted by the fluid in the eye (aqueous humor) which is too high for the nerve cells in that particular eye to tolerate. The optic nerve cells' job is to transform the light entering the eye into electrical impulses that can be understood by the brain. If enough of these cells die, then, some vision may be lost. The critical question, then, is how does the eye doctor detect tissue damage that is pressure-related? The short, but important, answer to that question is: "With difficulty." There is no pregnancy test for glaucoma. There is no dipstick indicator. There is no easy answer. One of the things making the doctor's job difficult is the fact that, though there are many signs and symptoms of the various types of glaucoma, almost all of them also could indicate other conditions,and not glaucoma. For example, decreased visual field, (the area visible to a person -- straight ahead, up, down, and to the sides) may be due to a retinal detachment or multiple sclerosis, or an optic nerve that was abnormally formed at birth. The optic nerve can have a bowl shape (which is called "cupping") because the person was born with a bowl-shaped nerve, has syphilis, is near-sighted, or has glaucoma damage. 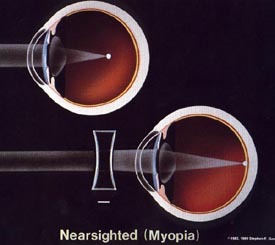 Nevertheless, the size of the optic cup is definitely related to the presence or absence of glaucoma: the larger the cup of the optic nerve, the greater is the likelihood that the person has glaucoma. In the type of glaucoma that is most common among people in the United States, the optic nerve gradually becomes damaged over a period of 10 to 30 years. The loss of nerve fiber occurs so gradually that the decrease in vision is usually not noticed until over half of the nerve fibers have died. Additionally, the area of seeing that is lost first is on the nasal side and involves one eye much more than the other. Consequently, it often isn't until both eyes have lost a great deal of vision that the afflicted person recognizes the loss. Contrary to what many people believe, the peripheral vision to the side is actually the last part of the vision to be lost in a person who has glaucoma. 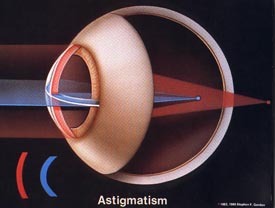 A thoughtful, thorough examination which takes into account a patient's family background (since glaucoma seems to be hereditary), intraocular pressure, visual field, and the condition of the optic nerve will allow the eye doctor in most cases to accurately determine whether a person has glaucoma. Once this basic determination has been made, the doctor will devise an appropriate treatment plan. He or she will then carefully monitor the optic nerve appearance, visual field and intraocular pressure to determine if any further damage is being sustained. When light enters the eye and focuses in two different planes. The cornea has two different curvatures (egg shaped) rather than one single curvature (spherical like a basketball). This makes fitting contact lenses challenging, but with today's latest technological advances, there are many options available for fitting contact lenses. when light enters the eye and focuses in one plane; however, the focal point fall short of the retina, resulting in a blurred image upon the retina. The focal point can be shifted to the retina with the use of corrective lenses; such as glasses, contacts, and laser refractive surgery. Macula degeneration is a condition where the central part of the retina becomes damaged. This means that the retina cannot properly transmit images to the brain, and vision is consequently reduced. Macula degeneration is considered to be an age related problem which comes aboout because the retina loses its ability to properly maintain itself. What problems might a person with macula degeneration experience? The vision loss associated with macula degeneration affects central vision. Often this makes great difficulty with tasks such as reading or looking at peoples faces. Who is at risk of developing macula degeneration? How will I know if I have macula degeneration? In the earliest of stages, macula degeneration can be without symptoms. However, as the retina begins to break down, symptoms such as distortion of vision, difficulty reading or seeing people's faces, unusual blurred vision may occur. What should I do if I think I might have macula degeneration? You should arrange for an eye examination with your local Optometrist or Ophthalmologist. Eye examinations in Australia are supported by the Medicare system for all Australian residents. 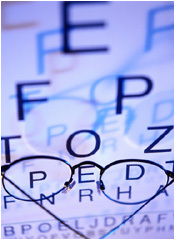 Referrals are not required for an eye examination with an Optometrist. Your Optometrist will advise you if you have developed macula degeneration, and if so, will be able to refer you to an eye specialist for treatment. How am I tested for macula degeneration? Macula degeneration, in its early stages, is diagnosed with viewing of the retina. Your Optometrist or Ophthalmologist perform this as routine with almost all eye tests. If your Optometrist or Ophthalmologist diagnoses macula degeneration, a further test called a 'fluorescein angiogram' can be organised to measure the extent of any changes. Can macula degeneration be cured? At this stage - no. But scientists are investigating the cause of macula degeneration, and hopefully, in the future this will lead to some form of preventative treatment. What treatment options do I have if I have macula degeneration? Treatment of macula degeneration is reasonably difficult, and in many cases, no treatment can be offered. Your Ophthalmologist will perform tests to see whether treatment can be performed, and if so, may look at options such as retinal surgery, or laser therapy.